Constantine Samuel Rafinesque published first descriptions of several genera and species of fishes. A few of them are described here, partly in Rafinesque's own words. Most of the photographs are the work of Konrad Smith and are used by permission. It reaches six feet in length, has a very obtuse and short snout, a falcated dorsal fine, a smooth skin, five rows of shields; the lateral rows composed of a great number of small shields, upwards of forty, &c.
David A. Etnier and Wayne C. Starnes, The Fishes of Tennessee, The University of Tennessee Press, Knoxville, 1993. 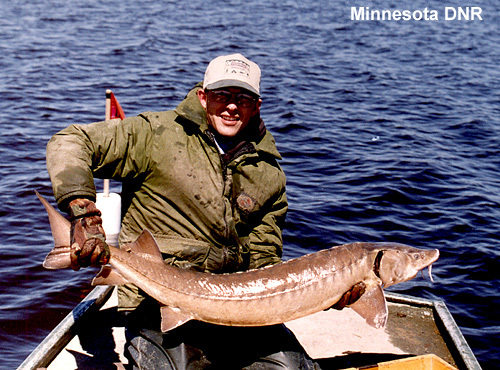 On page 100, it is reported that this species lives to be much older than other North American freshwater fish, with age estimates up to 154 years. The largest on record date from 1922, taken from Lake Superior, and 1943, taken from Lake Michigan. Both fish weighed about 310 pounds and were about 8 feet long. Rafinesque introduces this fish as the 97th species described in his book, Ichthyologia Ohiensis: Natural History of the Fishes Inhabiting the River Ohio and Its Tributary Streams, published in 1820. He assigned the species to the genus Acipenser, but it has since been placed in the closely related genus Scaphirhynchus. "Head one fifth of total length, flattened, snout flat oval, hardly obtuse, rough above, eyes round," writes Rafinesque. "Body pentagonal smooth, pale fulvous above, white beneath...A singular species, very common in the Ohio, Wabash, and Cumberland in the spring and summer, but seldom reaching as high as Pittsburgh. It appears in shoals in March, and disappears in August. It is very good to eat...Size from two to three feet, greatest weight 20 lb." On page 72 of his book, Ichthyologia Ohiensis: Natural History of the Fishes Inhabiting the River Ohio and Its Tributary Streams, Rafinesque gives the world's earliest scientific description of the shortnose gar, although the common name he reported was duckbill garfish. "Jaws nearly equal, as long as the head, about one ninth of total length, and flattened; body cylindrical olivaceous brown above, white beneath . . . This species is not uncommon in the Ohio, Miami, Scioto, Wabash, Mississippi, Missouri, Tennessee, Cumberland, &c. and other tributary streams. It reaches the length of four feet. It is taken with the seine, the hook, and even with the gig or harpoon." Along with measurements and other technical data, Rafinesque writes, "It is found as far as Pittsburgh and in the Alleghany River. Its flesh is as good as that of the Streaked Pike; but is erroneously thought poisonous by some persons."